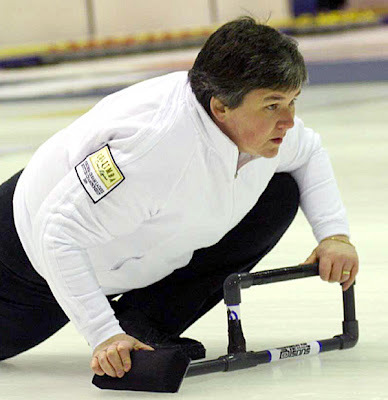 Gail Munro got past the first hurdle in getting to this year's Columba Cream Ladies Curling Championship playoffs when she and her team of Lyndsay Wilson, Sharon Stewart and Kerry Adams beat Mairi Milne, Claire Milne, Lynn Cameron and Katie Loudon in the first tiebreaker at Perth this afternoon. The Munro side now meet Claire Hamilton's team later this evening. It was a tight game, with Munro going into the last end one behind with last stone advantage. Mairi played her last and corner froze it to a Munro counter at the back of the tee. 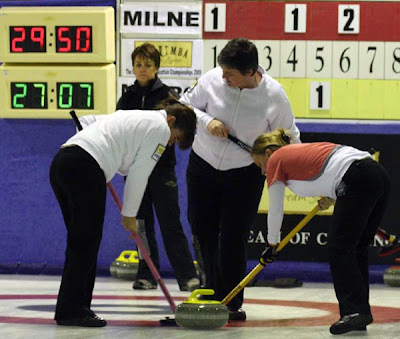 Gail was on target with her last to push the Milne shot away and count four, more than she needed for the win. Find all the results, linescores and links to the stats, here. Top: Kerry Adams and Sharon Stewart bring Lyndsay Wilson's stone into the house as Gail checks if it's level with the other Munro stone in the house.